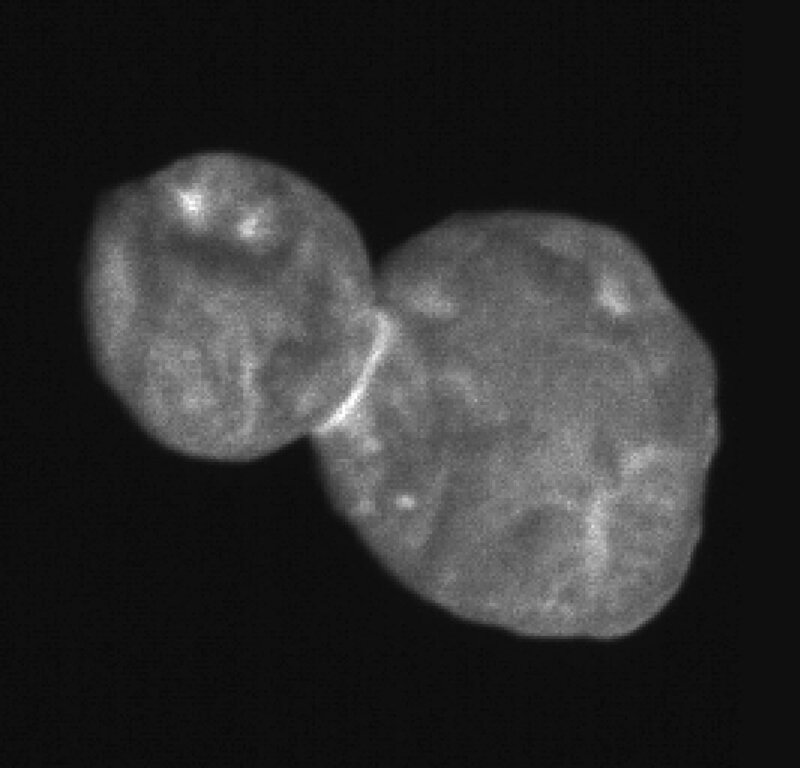 At left is a composite of two images taken by New Horizons' high-resolution Long-Range Reconnaissance Imager (LORRI), which provides the best indication of Ultima Thule's size and shape so far. Preliminary measurements of this Kuiper Belt object suggest it is approximately 20 miles long by 10 miles wide (32 kilometers by 16 kilometers). 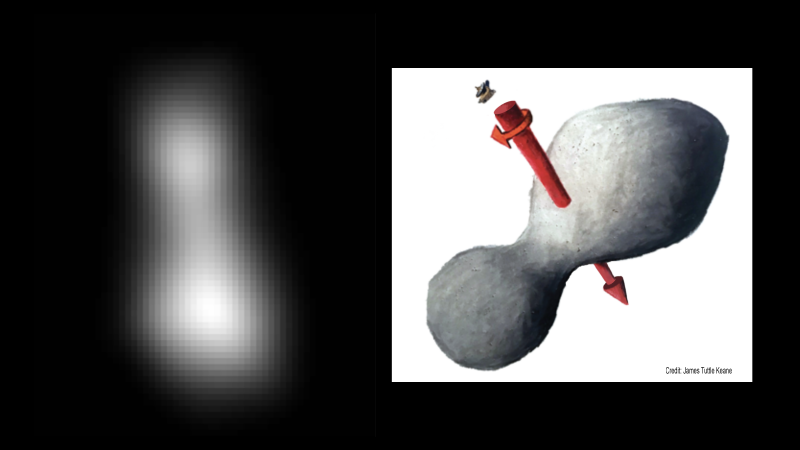 An artist's impression at right illustrates one possible appearance of Ultima Thule, based on the actual image at left. The direction of Ultima's spin axis is indicated by the arrows. Resolution and the addition of colour will happen soon... This is another inbound image. 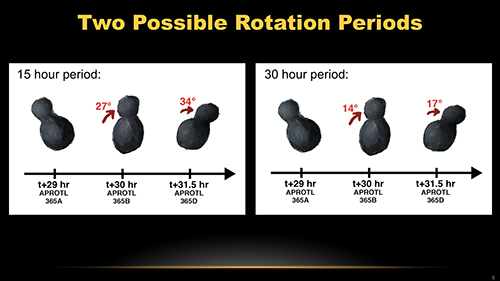 This sequence of three images, received on Dec. 31, 2018, and taken by the LORRI camera onboard New Horizons at 70 and 85 minutes apart illustrates the rotation of Ultima Thule. A cosmic bowling pin. The Dude abides, man. Where to watch/follow links at this page. The bowling pin idea is replaced with a snowman or pre-duck (in reference to comet 67P) made by a contact binary (sorry, the Dude) coloured red. Scale: 33 km from the "top" of the little one (Thule) to the "base" of the big one (Ultima). Thule is 1/3rd the volume of Ultima. Image taken about 1 hour before closest approach at a range of about 50 000 km. Rotation period determined at 15 hours (axis as on previous image up topic). Last edited by newolder on Jan 02, 2019 8:01 pm, edited 6 times in total. newolder wrote: The bowling pin idea is replaced with a snowman made by a contact binary (sorry, the Dude). In naming that distant object “Ultima Thule,” NASA also tapped into one of human history’s darkest passages. The term, which dates back to ancient Greece and Rome, refers to a frigid “place beyond” the lands that the West had explored at the time, and was later co-opted by the Nazis to refer to the mythological birthplace of the Aryan race. Well, Frosty is probably a Dude. How lame. The take-offense brigade is at it again. Obviously New Horizons is exploring the outer reaches of the solar system, so calling one of those outer objects an ancient Greek name for a "frigid place beyond", which it literally is, is entirely appropriate. Can these people just shut up and get on with their useless lives? What's next, Hitler liked dogs so now we have to euthanize them all? Well, that's HuffPo for you. The founder and owner sold the site to AOL for $315 million in 2011, but HuffPo paid its writers nothing until not quite a year ago. Now it pays some of its contributors a pittance, and you know the old saying: You get what you pay for. Alan Stern addressed this in the latest presser. Paraphrase: Just because some bad guys took this name for their dire politics doesn't mean we cannot reclaim the name (meaning "frigid place beyond") for our distant explorations beyond Pluto and close to absolute zero temperature. Edit to remove misplaced comma. Last edited by newolder on Jan 03, 2019 11:25 am, edited 1 time in total. Like I said somewhere else, I think most people are completely unaware of this until they encounter a news article like this. It's not just Huffpo though, similar articles have appeared in other news media, among which the Israel Times and the NY Times. newolder wrote: Alan Stern addressed this in the latest presser. Paraphrase: Just because some bad guys took this name for their dire politics doesn't mean we cannot reclaim the name (meaning "frigid place beyond") for our distant, explorations beyond Pluto and close to absolute zero temperature. All images from yesterday's press conference here. Insert your location into this wolframalpha box to see the size of Ultima Thule compared to that locality. It looks a bit like a double bellend so if nazis want it as a symbol I couldn’t think of anything more appropriate.